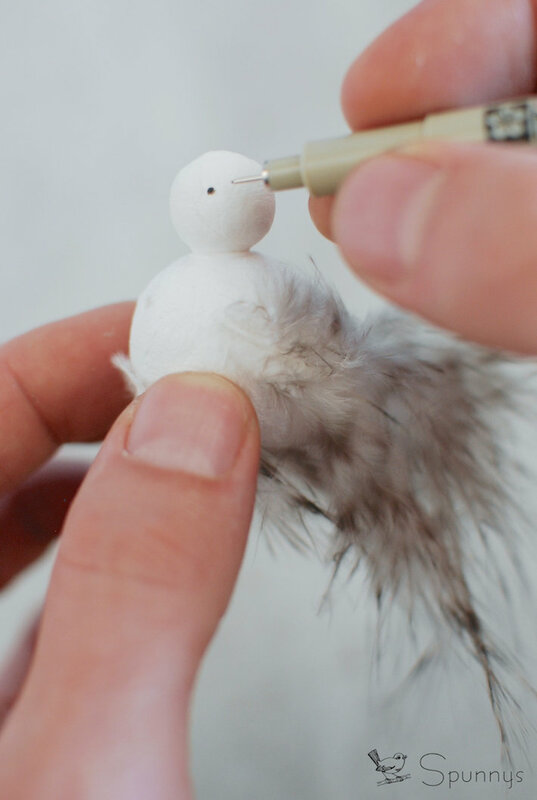 Making your own feathered bird ornaments doesn’t have to be difficult. 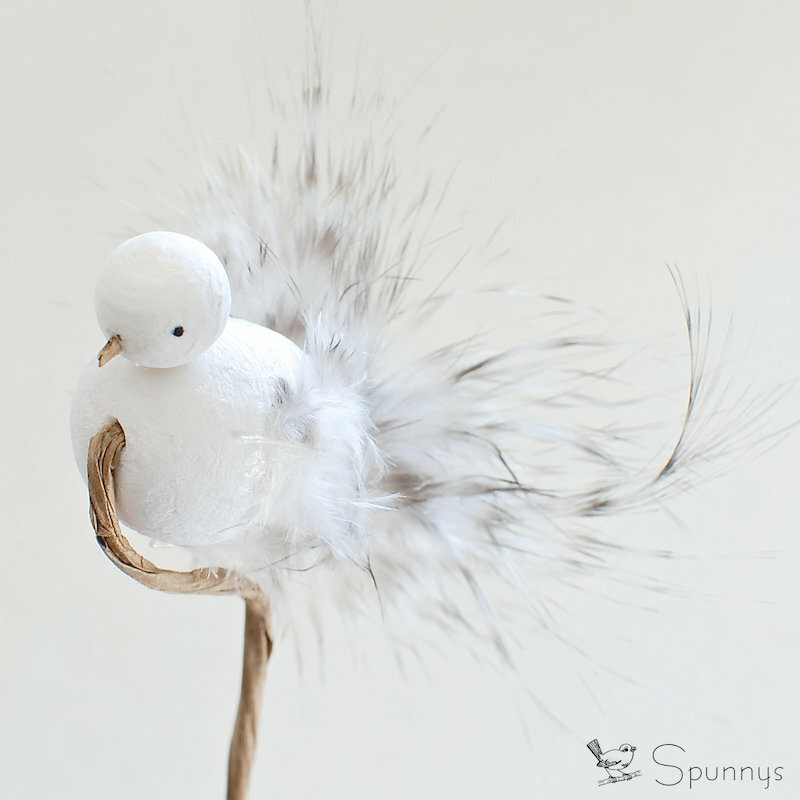 In this step by step tutorial, we will show you how we made a beautiful and elegant little bird ornament using only a few feathers and a couple of spun cotton shapes. 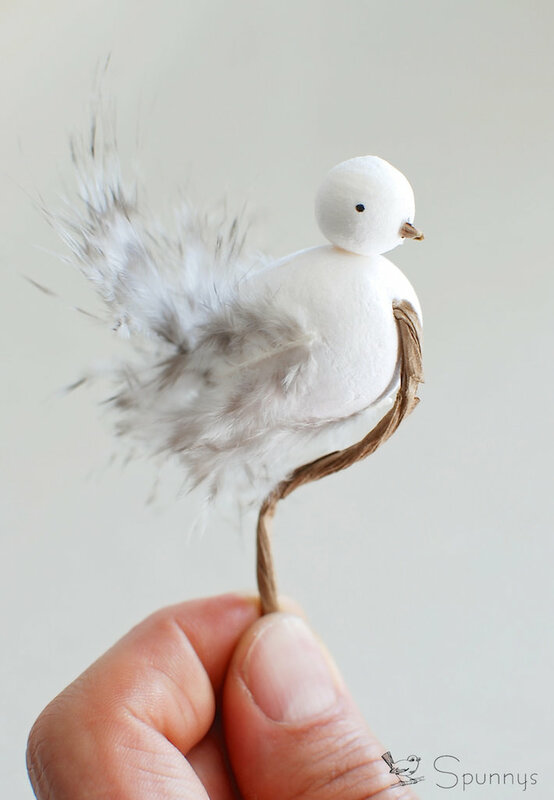 This little birdie is displayed on a strand of floral stem wire. 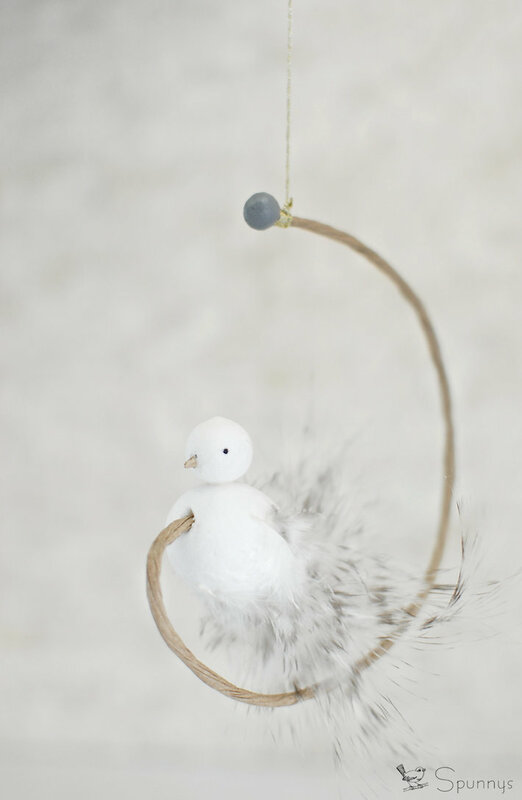 As you can see on this example, our little bird ornament is very simple, but we’d like to think it looks elegant :). 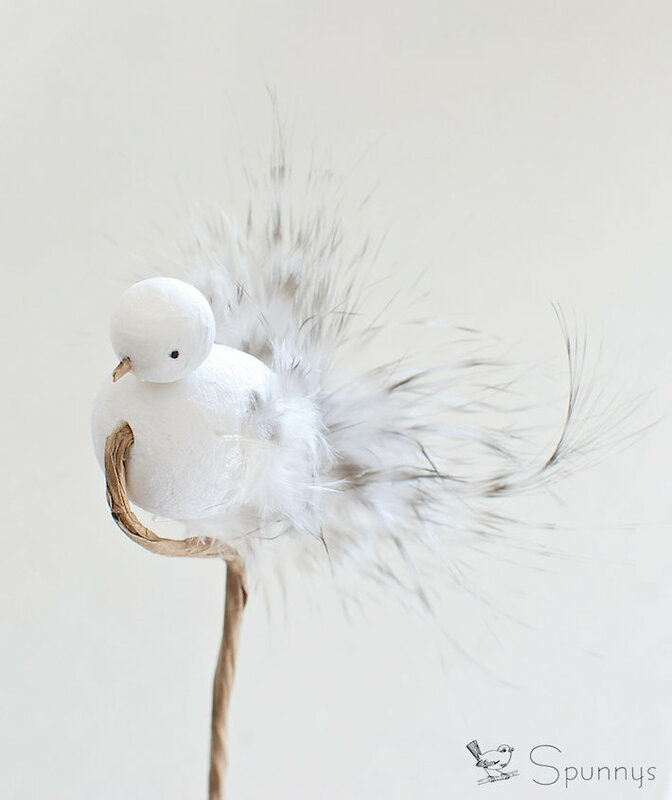 Our bird ornament is mounted on a piece of floral stem. Floral stem can be bent in any possible and imaginable way (just like pipe cleaners). 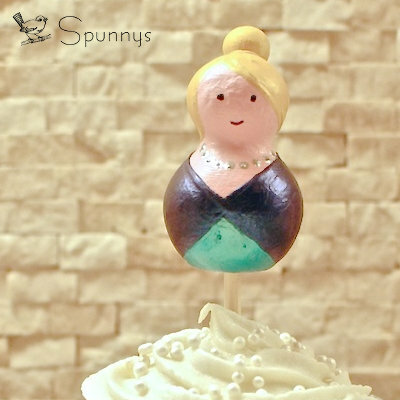 The floral stem could be kept mostly straight so that it can be inserted into a floral bouquet. Or it could be curved up and attached to a piece of string so that the ornament can hang from the ceiling for example (see picture below). Floral stem wire can be twisted and bent any imaginable and possible way. 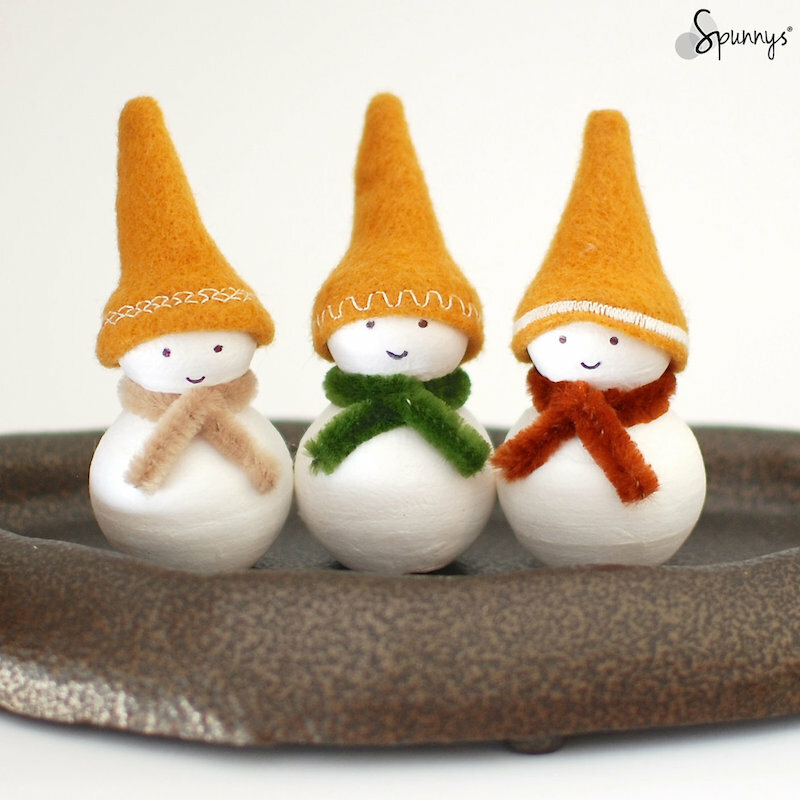 A spun cotton ball painted gray was added on top. 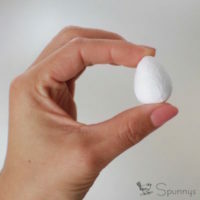 One spun cotton egg for the body. We used a 40mm egg. 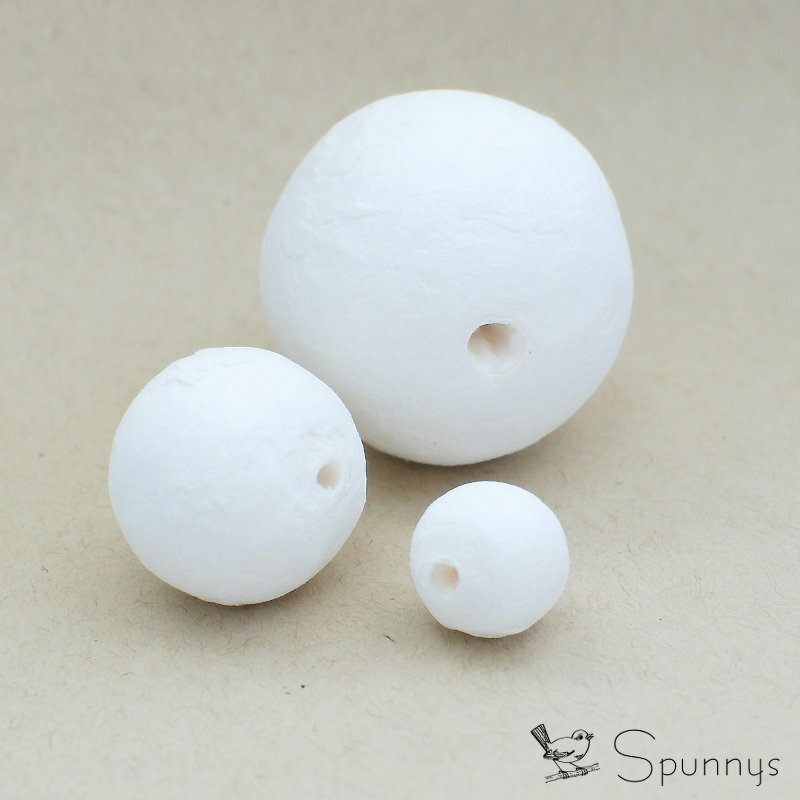 Spun cotton eggs come in plenty of sizes. The sizes on this picture are 12, 18, 20, 25, 30, and 40mm. Each size egg has a slightly different shape. 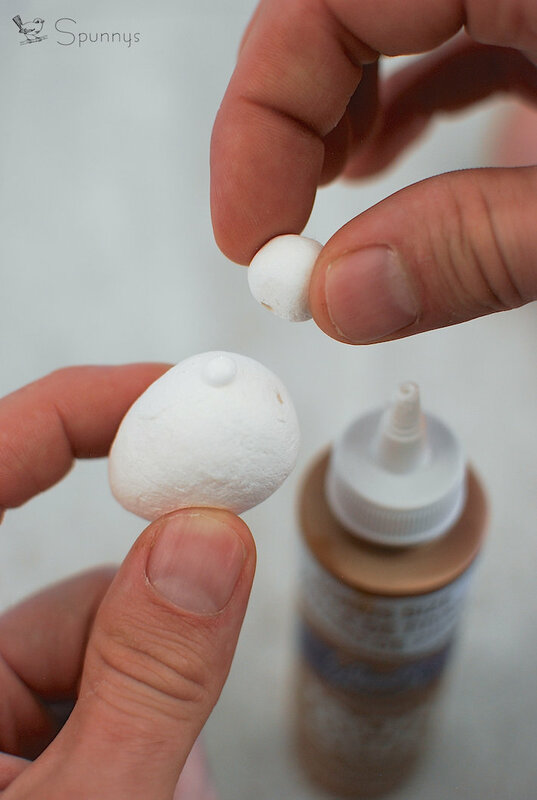 The 40mm eggs for example have a slender and pointy shape. 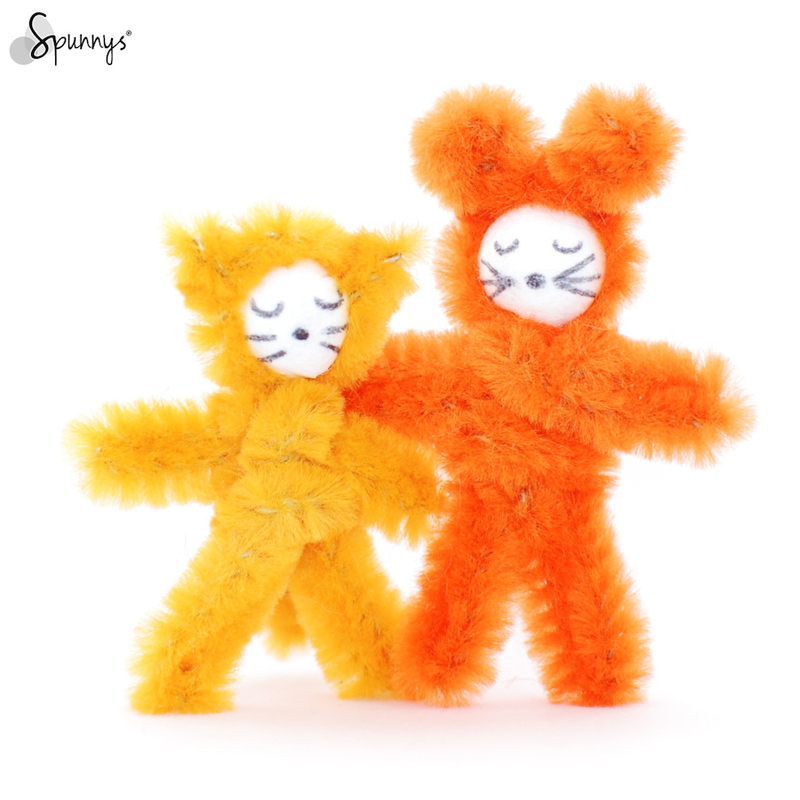 More pictures can be found on the SPUNNYS spun cotton eggs page. 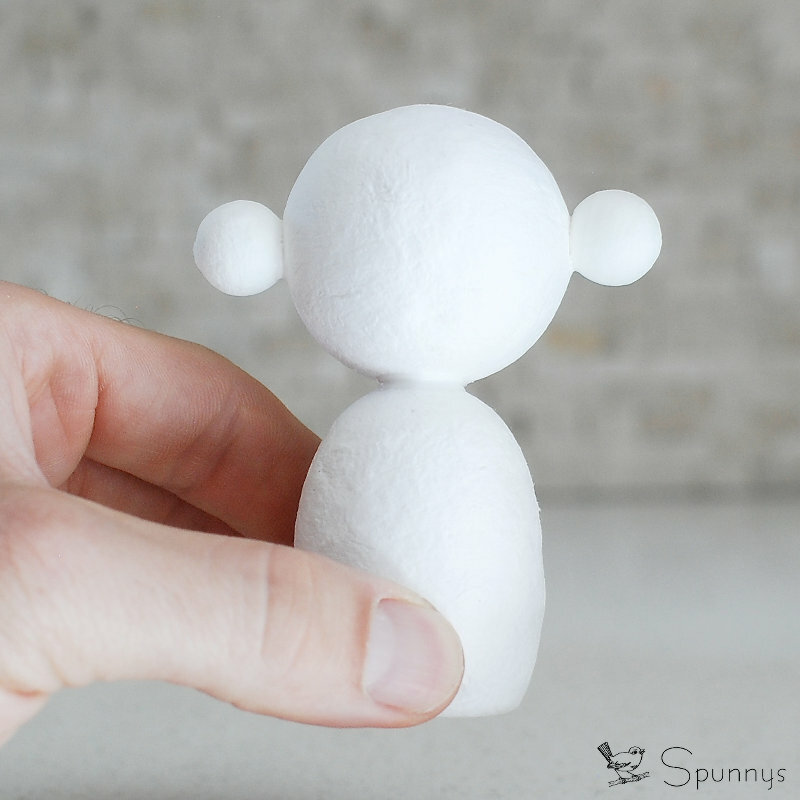 One spun cotton ball for the head. We used a 15mm ball. 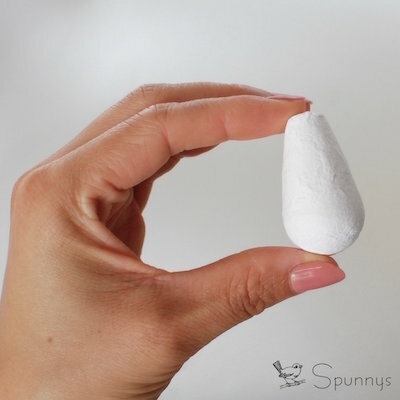 Spun cotton balls come in plenty of sizes as well. 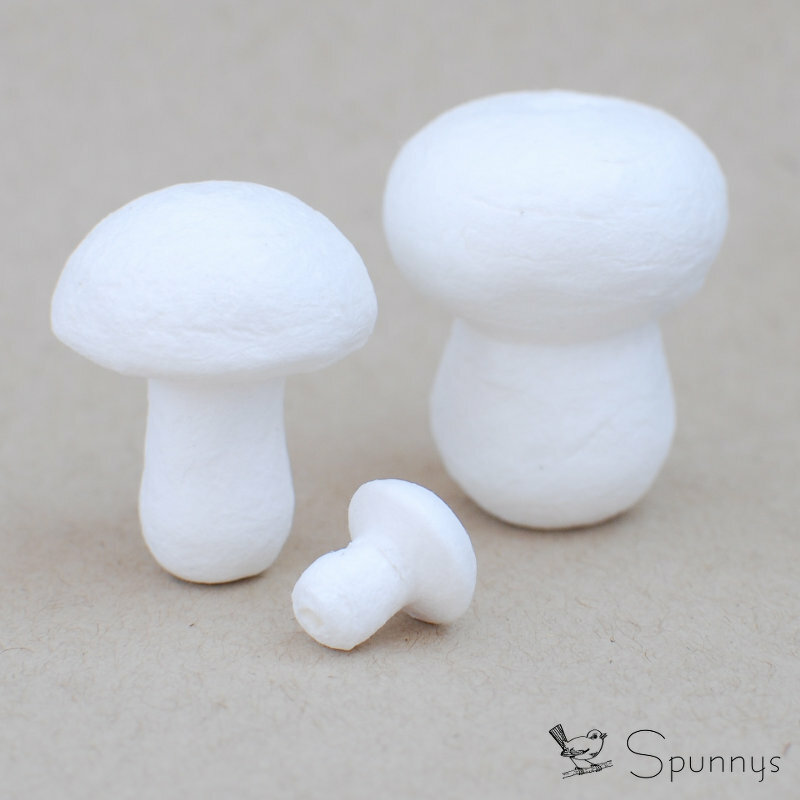 The sizes on this picture are 6, 8, 10, 12, 15, 18, 20,25, and 30mm. 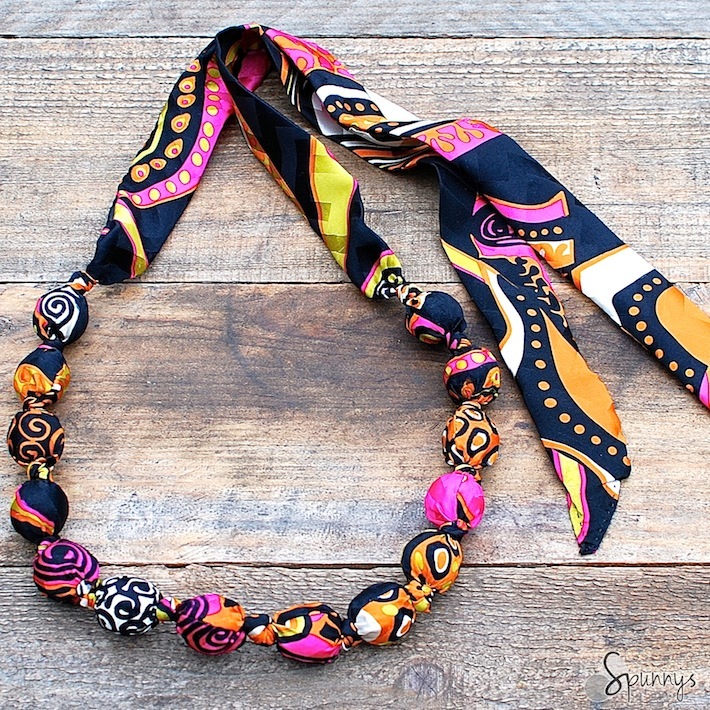 Spun cotton shapes are great for this project. They are lightweight, and they can be glued to anything or to each other. 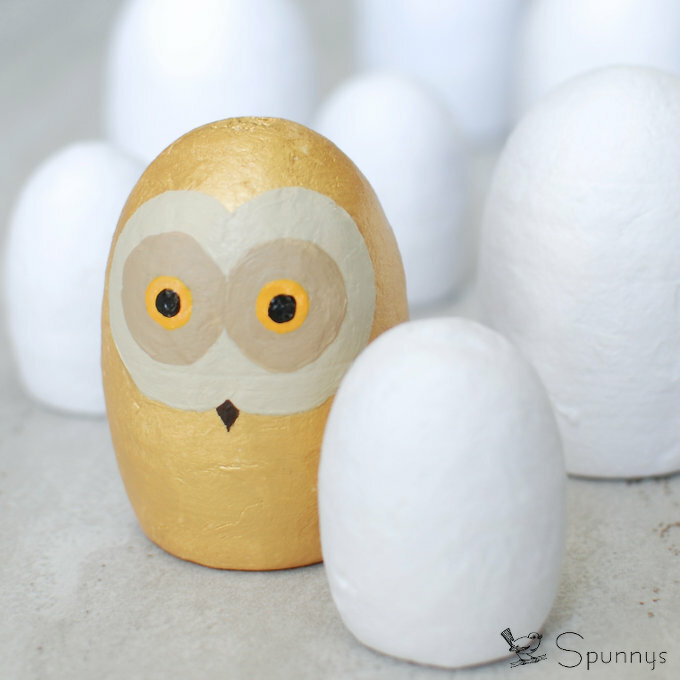 They can also be painted or drawn on with crayons, markers or pencils. 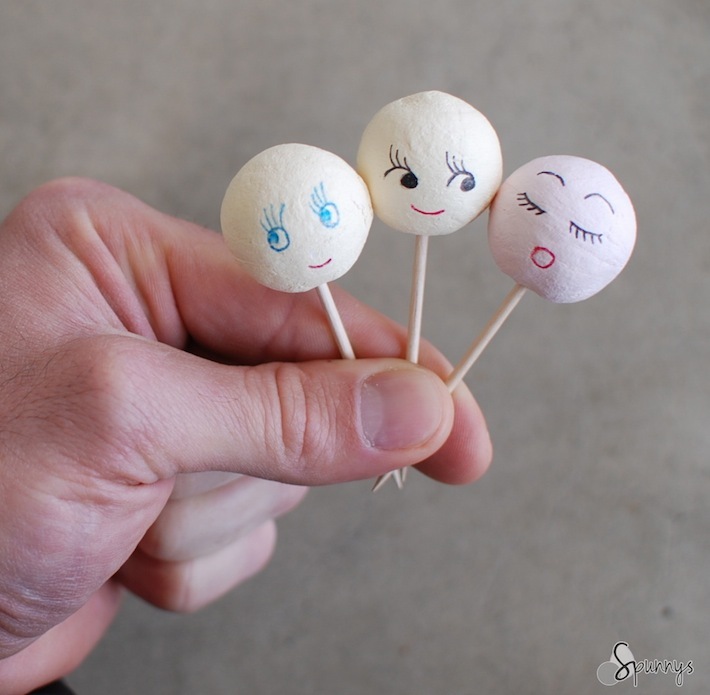 Last, they have a little hole on one side in which a toothpick or a piece of stem wire can easily be inserted. Spun cotton eggs and spun cotton balls come in many different sizes, from about a 1/4 of an inch to a couple inches. 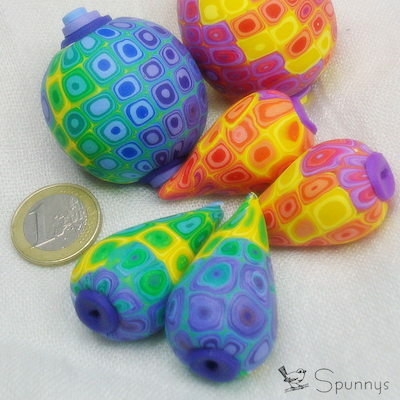 I chose a 40mm egg and a 15mm ball, but many combination of sizes would have worked. One strand of 18 gauge paper wrapped floral stem wire. A few feathers. We used three for this project. We wanted a bird project that makes conservative use of feathers but still looks great. I used three of these feathers. 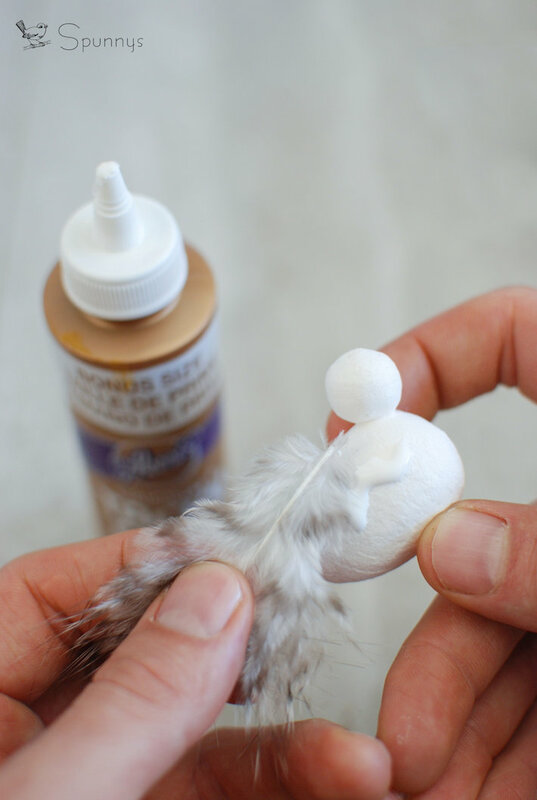 A little bit of glue to glue the feathers to the spun cotton shapes and to glue the ball and the egg together. We used regular white tacky glue. It works very well. 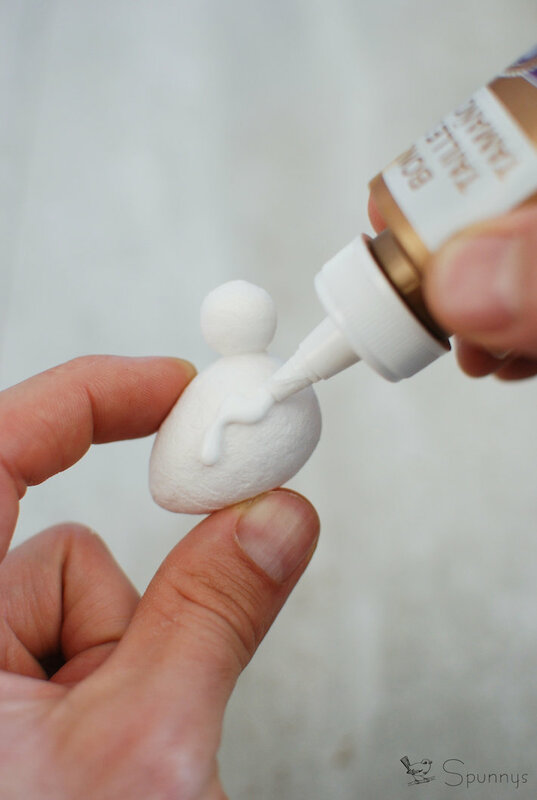 It dries fairly fast and creates a strong bond. A tiny fragment of a wood twig for the beak. A black marker to draw the eyes. 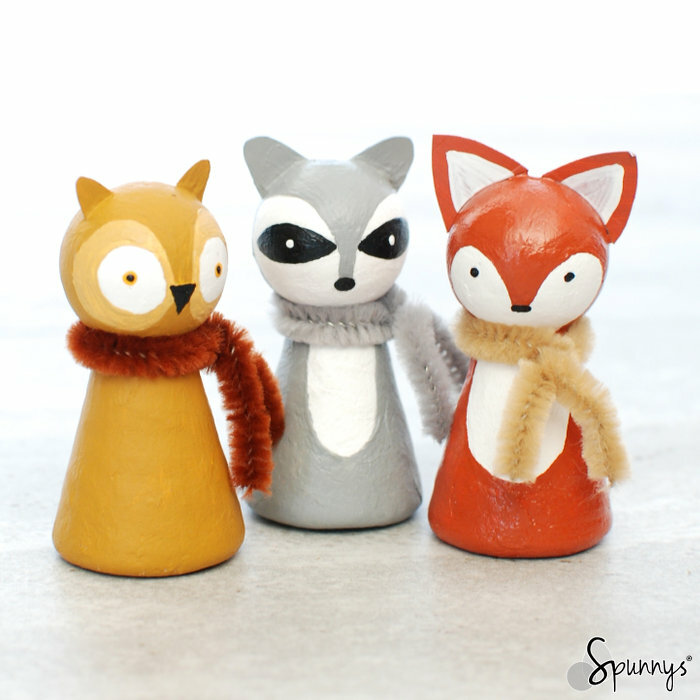 Note that there is no need to use any sharp and potentially dangerous objects to make this project. 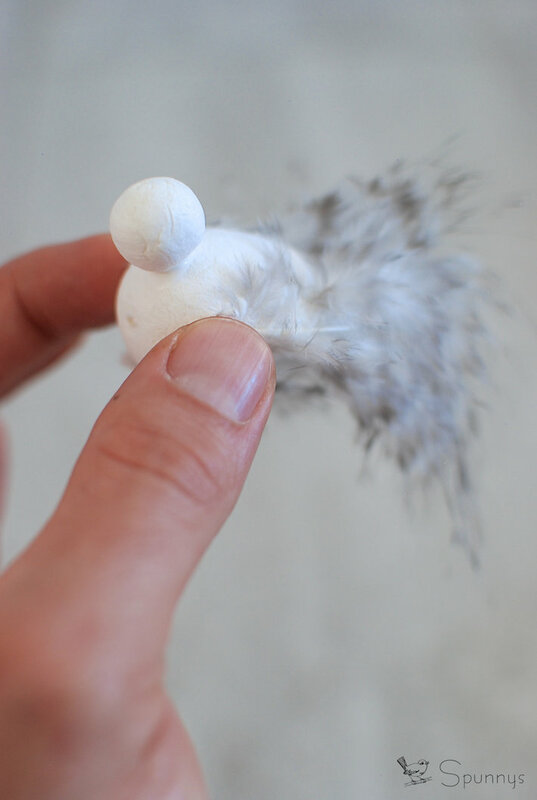 Step 2: Glue the three feathers onto the spun cotton egg. One feather goes on each side and one feather goes on the bottom. 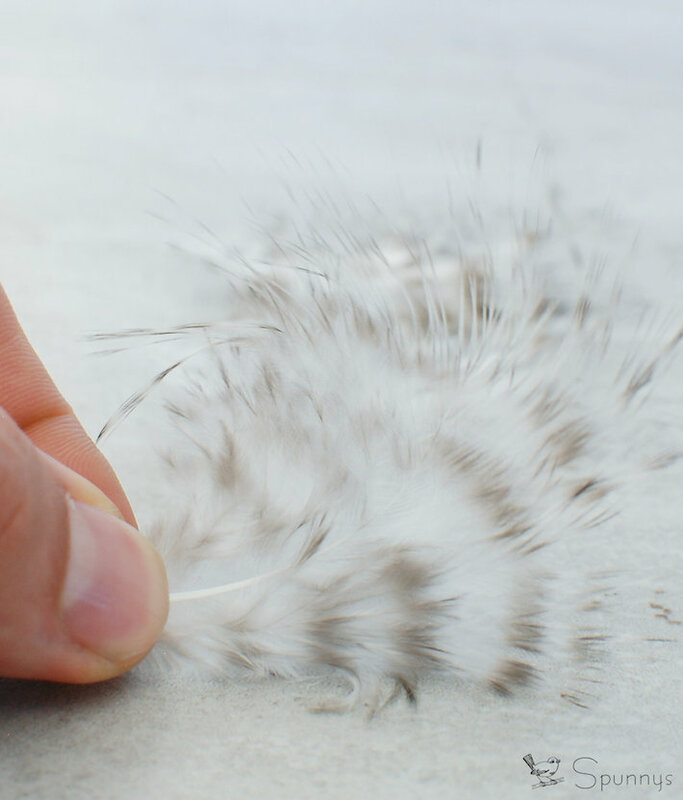 Just a little bit of glue is enough to make the feathers stick. On the picture I used a little too much. Only 3 feathers were used in total: one on each side and one on the bottom. Notice the feathers are naturally curvy. Make sure the 3 feathers all point inward, not outward. Step 3: Draw the eyes with a black marker. It’s recommended to mark the position of the eyes with a pencil first. Make sure the pencil marks are at the same level on each side before going over them with a permanent marker. 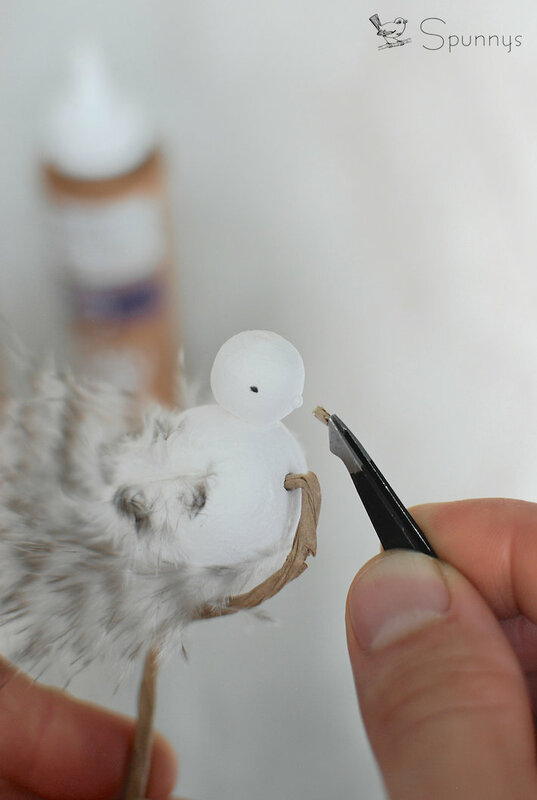 Step 4: Cut the bird ornament’s beak in a little piece of wood, such as a small twig. This is the most delicate part of the project. 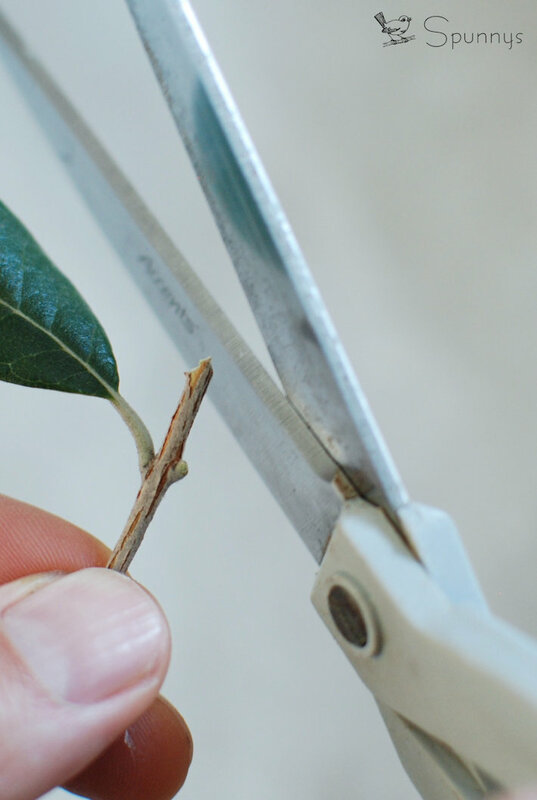 When the cutting and carving of the beak is done, a pair of tweezers can be used to glue it on. There is no rule for how long the beak should be. The hole in the front of the bird can be used to stick a floral stem. 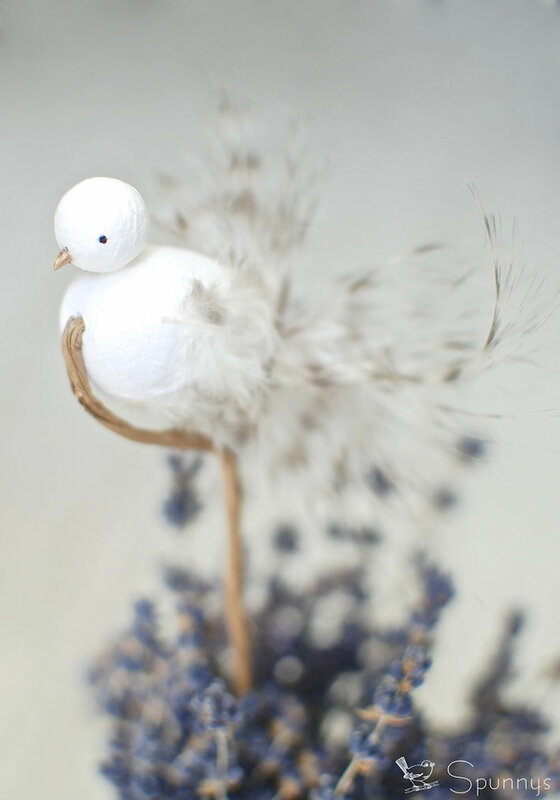 We bended the floral stem in a way that makes the bird ornament look like it’s floating on top of the stem. 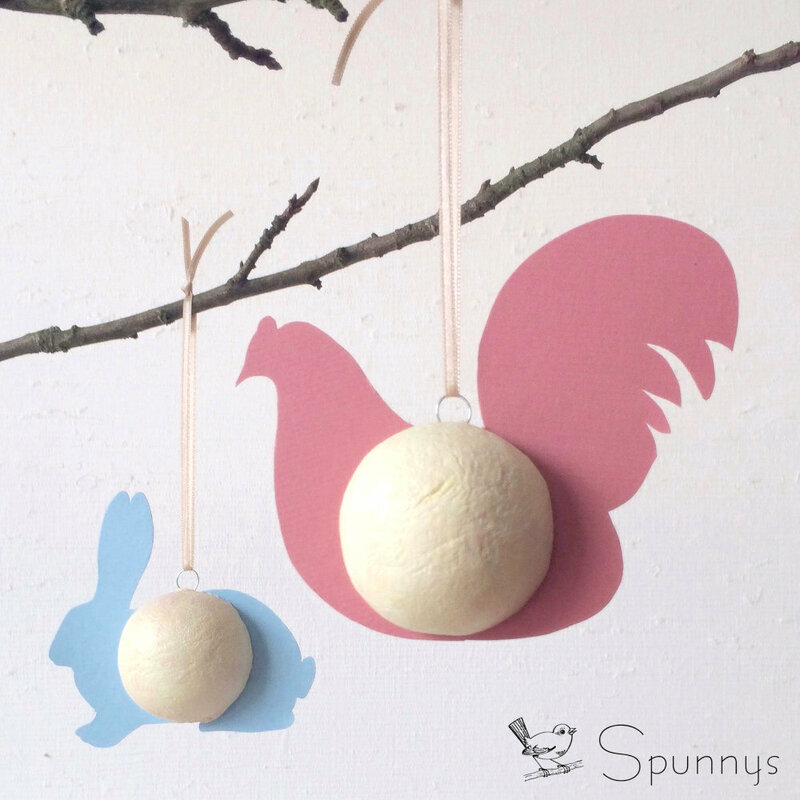 We hope you enjoyed this tutorial and got some inspiration and some motivation to get started with your own bird ornaments. And as always, if you have any questions or if we can help you with anything, do not hesitate to leave a comment. NOTE: we would like to say thank you to our talented milliner friend Shelley at Chapeaux by Shelley. 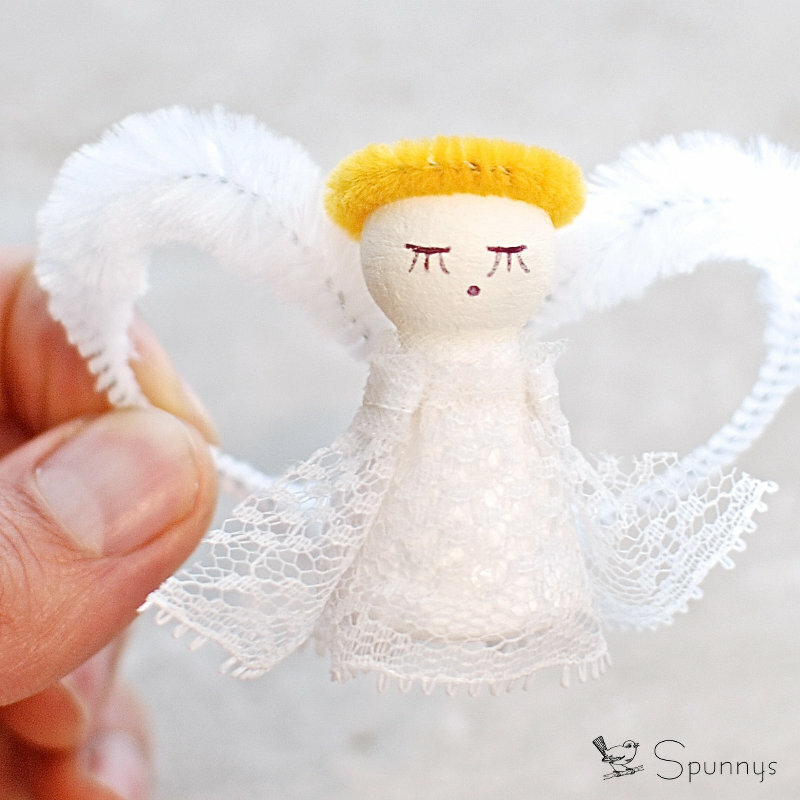 Shelley sent us the feathers and trusted that we would be able to put them to good use. Thank you Shelley!